I’m going to try and look at a variety of areas in terms of comparisons, the obvious, but perhaps the less so too, which may be of more interest to a wide range of Zwifters. Over the last couple of years I have easily done over a couple of thousand kilometers on both the Tacx Neo and Wahoo KICKR (admittedly not the 2017, but as the changes for the 2017 model are exceptionally mild, I think my experience of the Wahoo KICKR “Handle Edition” still counts), so I have a pretty good handle on their pros and cons. Across these articles, I’m actually not going to award points, or anything quite so prescriptive, as everyone will weigh different aspects of the trainers. However, opinion is important, so I will get off the fence, and make the call on which of the two trainers I would buy! We know that these two trainers are pretty much the top of their bracket concerning specs, but are there any differences in the specifications? More importantly, do those differences matter to the end user? I think the great analogy there is buying a 200mph sports car in the UK, where the speed is limited to 70mph. Yes, you’ve got an impressive spec sheet, but can you actually use it in real life, or are you essentially playing VERY expensive Top Trumps? So that is the data, but what does this mean? Well, let’s look at the differences from the top. The Tacx Neo is a sealed box, in a sense it has you covered on speed, power and cadence reading right out of the box. While the Wahoo KICKR, still a great bit of kit, lacks an internal cadence sensor. BUT the lack of internal cadence becomes one of those swings and roundabout moments, as the Wahoo KICKR includes a Wahoo Cadence sensor in the box to overcome the lack of internals. 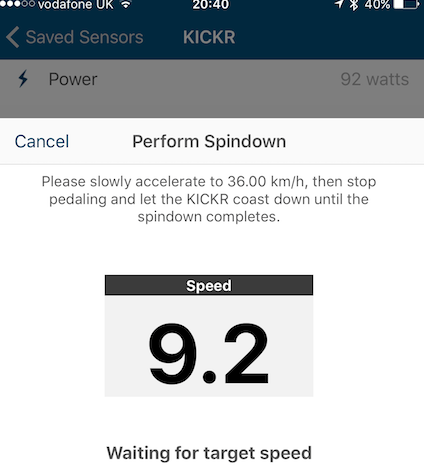 If you don’t already have a cadence sensor on your bike, this is a firm tick on the Wahoo KICKR from the economies point of view, as on the same bike outside. The fact the sensor is due Bluetooth and ANT+ mean you’ll be able to use it with your cycling head unit, or your smartphone, whichever your budget dictates that you use. BUT if you are using multiple bikes of the trainer, the need for each to have a separate cadence sensor may be annoying. Staying g with economies, the inclusion of the SRAM cassette with the Wahoo KICKR again boost to the value side of things, if you can talk about value for money with a straight face when looking at a £1000 trainer. Perhaps another way of looking at things is that the Wahoo KICRK comes ready to ride, straight out of the box, whereas the Tacx Neo needs you to provide and install your own cassette. Speaking of the cassette, the Tacx Neo can be mildly complicated to install a cassette on, due to the use of an EDCO hub. Pre 2017 units shipped with a hub compatible with Shimano, SRAM AND Campagnolo, making a slightly tricky installation. For 2018 models, the hub has been changed to work with Shimano and SRAM only, with a Campagnolo body now sold separately. This is improved installation, but it still remains worthwhile reading over the cassette installation instructions as many people will not be familiar with this hub type. The Tacx has a direct win in terms of accuracy, coming in at a variation of 1% vs the 2% compared to the Wahoo KICKR. However frequently people can get the wrong end of the stick with trainer accuracy. As shown when I visited Tacx last year, the accuracy level quote will be the WORST accuracy that the trainer will display. Frequently a trainer will be much more accurate than the quoted figure, but not worst than it. So why is 1 and 2% trumpeted on the spec sheets?? The biggest deviation in accuracy tends to be seen at highest wattage, as the system is under more stress. Apparently, from a marketing perspective, it looks better to have a trainer that can record higher watts, than trainers have a trainer with a massively accurate power meter. The Wahoo KICKR is able to record 2000 watts, within a 2% deviation of accuracy at that point. Conversely, the Neo can handle 2200watts and within 1% accuracy. So we’ve already established that the trainers will be more accurate than the numbers of the box, what about the power numbers though? Heck, I don’t know any riders who are going to be able to sustain 2000watts for more than fractional periods of time, so 2000 vs 2200 probably doesn’t matter. Another minor point towards with regard to accuracy is that the Tacx Neo power meter doesn’t require calibration at any point. As a user, you can just get on and ride. 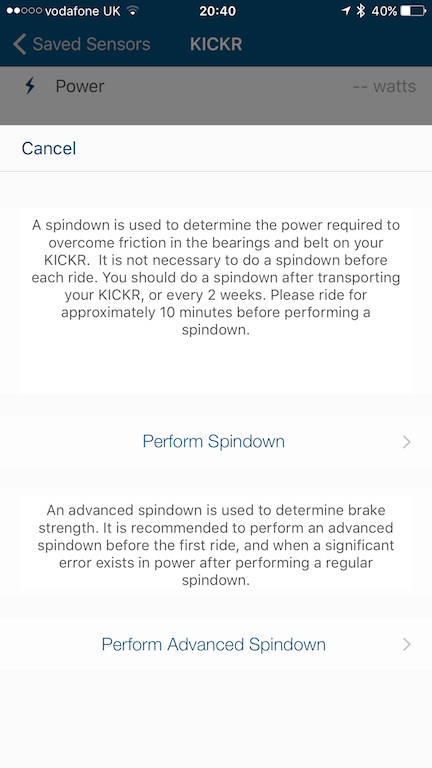 By comparison, you should ideally perform a calibration test on the Wahoo KICRK about once a month, ideally before any serious Zwift Races, and certainly after every time that the unit has been picked up and moved. So that little deviation out of the way, let’s continue walking down spec sheet! – The Wahoo KICKR has a wider range of wheel type, and wheel hub compatibilities. In addition, the 2017 version has larger cutouts to accommodate disc wheels more effectively, which again may be relevant if you are using many different bikes on the trainers. We’e already commented that the Tacx Neo beats the Wahoo KICKR on spec sheet Top Trumps for maximum wattage – 2200 vs 2000, but the Neo also has a greater maximum simulated incline. Again, does this actually matter? the Wahoo can cranking things up to 20% whilst the Tacx Neo keeping delivering the pain up until 25%… but on Zwift, the current maximum incline is 17% headed up to the Radio Tower. Yes, there is the forthcoming Zwift Alpe d’Huez, but the real world maximum incline there is 13%, so unless Zwift decided to step away from a 1:1 representation of the world famous route, both trainers will still have plenty of head room. It is only in the ridiculous workouts from the deranged brain of certain Zwifters (Tim Fulford at Cyclehub.tv I’m looking at you) where you are may to see things go over 17% currently. There are several contrasting areas between the two trainers where one unit is able to land a sizable body blow on the other one. When it goes to storage, the Wahoo KICKR leaves the Tacx Neo reeling. Whilst both turbos do pack down very nicely, on the Wahoo KICKR l it is a doddle to hook your bike on and off the turbo. Once the steed is off, with the Wahoo KICKR, you press down on the machined knobs over the legs, allowing you to release the locks on the, and fold the unit in. If you want to make life a bit fiddlier, but also drop the height of the Wahoo KICKR for storage, you can remove the height adjuster block. The Wahoo KICKR handle is brilliant, and you can quickly move it around with one hand. The clasps are released with catches on the underside of the unit, which just seems badly located. i find you have pick up the trainer slightly to stop the clips relocking, which takes a little time to get used to it, and I frequently, find I use my feet too!!! But once actually folded up, both trainers are reasonably compact in their footprint, so shouldn’t have any issues for storage, although you’ll likely find you want to be packing the Neo up less often! The reason the Wahoo KICKR 2017 exists is to provide a strengthened platform to allow for the newly released Wahoo KICKR Climb to change the height of the front of the trainer without destroying the KICKR axel mounting over time. This is needed as when the pre-KICKR 2017 was designed; it was not considered that the rear axle would remain anything other than stationary. Aside from the Climb side of things, the Wahoo KICKR 2017 doesn’t have much scope for upgradability itself, but it does allow for potentially for you to upgrade to the Wahoo KICKR Climb if you really want to get the most out of Zwift… and have deep pockets in order to buy an accessory for your cycling accessory!! However there have been a series of major changes in the firmware since the release, firstly adding Tacx road feel – allowing the Tacx Neo to simulate up to nice different road surfaces. Road feel is possible as the system inside the Tacx Neo makes millisecond changes the electric currents going through the magnets which form the resistance unit. This causes different patterns of resistance, causing the sensation of various road feel simulations. You get a shift in noise tone from the Tacx Neo, to go along with a change in the vibration pattern as you pedal, really making the different terrain in Zwift a more immersive experience. Regarding which unit should you put in your pain cave, while the Wahoo KICKR is the better bet if you don’t have a fixed setup, what about time in the saddle with each unit? Again both of these turbos are some of the best indoor trainers that money can buy, so the actual differences between the two smart trainers are going to be mild and nuanced. for example the Neo has a wider stance than the Wahoo KICKR, which technically means more stability – although the lower center of gravity on the Kickr means both units are exceptionally well planted. The Tacx Neo case is made from the same type of plastic as riot shields, meaning there is a degree of flexibility built into the case. Some people may prefer the “locked down” feeling of the Wahoo KICKR, but I tend to find it is a more comfortable Zwift session using the Tacx Neo due to the movement, something which I recently praised in the Kinetic Rock and Roll review – but I appreciate that we are talking about two VERY different machines here. Well, that is the hardware discussion out of the way, now down the brass tacks, what happens when we power up these two giants, and let them rip on Zwift? The problem here is that we are talking about two of the trainers to which all other smart trainers are compared against on Zwift, and which have literally had years of polish applied to their firmware. As such, the crucial things people care about when spinning around on Watopia are dealt with aplomb by both systems. There is very little discernable lag with either the Wahoo KICKR or the Tacx Neo as you approach hills, and reaction times are pin sharp on the Watopia Esses – which when Zwift first launched tended to trip up trainers. Wahoo and Tacx have now polished their firmware to an electronic perfection… although Wahoo does occasionally have more issues with ergo mode, where the resistance increase significantly so you are on a cadence 5-10 RPM!! With the KICKR Climb, Wahoo has a way of ratcheting the immersion on your Zwift session up, in contrast, Tacx has downhill simulation and road feel. I’m not really going to delve into the Climb here, as that is a second product. Many riders comment that they prefer the base road feel on the KICKR, with the Neo feeling slightly detached. The Neo does compensate, as the unit can almost literally detach the resistance when I’m down hills. Not only to zero the resistance when you are on the descent sections, but also to adding in an electronic push which simulates the pull of gravity. So who is going to win the first TurboTrainer Wars?? Wahoo KICKR, with the industrial construction, or the Tacx Neo with its technological tour de force? Similarly, the Wahoo KICKR is a touch easier to actually mount a bike on, and with the latest edition, is more forgiving towards fitting different axels and disc brakes. BUT if you are lucky enough to have a Zwift Cave to call your very own, then the presence of a handle is kind of a mute point. Both trainers are accurate to absurdity, but for me, the slight sway, as a result of the Tacx Neo construction actually makes all the difference. As I recently commented on in the Kinetic Rock and Roll review that extra moment has greatly improved the discomfort, I felt riding. Now the sway of the Tacx Neo is nowhere near that of the Green Machine, but it does give some movement, and that is all the better. Yes you could build yourself, or now buy a rocker plate for both of these units, but currently, I’m talking about what comes out of the box. I enjoy the KICKR scream when it comes to dropping the watt hammer, and sprinting to the line on Zwift, but for the rest of the time when I’ve riding round, I’m actually happier with the quieter magnetic system from the Tacx Neo. The Wahoo KICKR can be given an extra feather in the cap with the KICKR Climb, but again that is an additional £400-500 for a system that is moving you more towards as static Zwift system. Not that that is a problem, but again I’m only looking at the current box contents. On which note, the Tacx Neo has everything built in the unit and does allow for advanced pedal analysis if you use the Tacx software. A feature with Wahoo cannot compete with currently. As for reliability, I’ve had two KICKERS and two Neos in the past. So happy to call it a draw. Plus I’ve actually been to Tacx HQ and see how the whole of the Tacx Neo is built on site, and the love, and pride with which the designers and engineers have for their products. Ultimately I’ve found I’d send my money to the Netherlands rather than the USA. Now it is a VERY tight margin of victory, and again this is a PERSONAL choice. But for me, it is the pedal analysis, trainer flex, and real-world road feel which just push the Neo over the line for me. Some people may be swayed to the Wahoo KICKR for other reason, shout out in the comments below! Both trainers are great bits of kit and superb bits of engineering. But I said I’d get off the fence. So in the first head to head Zwift Turbotrainer Wars, I’ve given a TitaniumGeek Recommend to the Tacx Neo!